This article is about the television series. For the film adaptation of the same name, see 21 Jump Street (film). The series provided a spark to Johnny Depp's nascent acting career, garnering him national recognition as a teen idol. Depp found this status irritating, but he continued on the series under his contract and was paid $45,000 per episode. Eventually he was released from his contract after the fourth season. A spin-off series, Booker, was produced for the character of Dennis Booker (Richard Grieco); it ran one season, from September 1989 to June 1990. A film adaptation directed by Phil Lord and Chris Miller was released on March 16, 2012. The film is set in the same chronology as the series, with Johnny Depp, Holly Robinson and Peter DeLuise reprising their characters in cameo appearances. Richard Grieco and Dustin Nguyen also have cameos in the 2014 film sequel 22 Jump Street. The series focuses on a group of police officers headquartered at the eponymous address. These officers are all young and have especially youthful appearances, which allows them to pass for teenagers. Their assignments generally consist of undercover work in high schools or, less commonly, colleges, where they generally investigate drug trafficking and abuse. The show's plots cover issues such as alcoholism, hate crimes, drug abuse, homophobia, AIDS, child abuse and sexual promiscuity. Similarly, each problem is often solved by the end of the hour-long episode, giving an implicit moral about the impact of a particular activity. When the show originally aired, some episodes were followed immediately by public service announcements featuring cast members. Jeff Yagher was originally cast as Officer Tom Hanson in the pilot. He was replaced after the original pilot episode was filmed, and his scenes were reshot with Johnny Depp. Midway through the first season, Frederic Forrest was replaced by Steven Williams. On the show, Forrest's character Richard Jenko is killed by a drunk driver. Johnny Depp left the series at the end of the fourth season, but was credited in the first two episodes of the fifth season, despite not having appeared. Some notable guest stars on the series include: Dom DeLuise, Josh Brolin, Mindy Cohn, Bridget Fonda, Bobby Rodriguez, Jada Pinkett Smith, Brad Pitt, Vince Vaughn, Blair Underwood, John Waters, Rosie Perez, Kareem Abdul-Jabbar, Mario Van Peebles, Christina Applegate, Pauly Shore, David DeLuise, Bradley Gregg, Jason Priestley, Christopher Titus, Sarah Buxton, David Paymer, Diedrich Bader, Russell Wong, Kelly Hu, Shannon Tweed, and Peter Berg. Set in a fictional city and state (Metropolis, Evergreen State) in the United States, the series was primarily filmed in Vancouver, British Columbia. It was one of the first major television series to use Vancouver as a filming location and helped to establish the city as a center for film production. 21 Jump Street, along with Married... with Children and The Tracey Ullman Show, debuted in the spring of 1987. All three shows were hits with audiences and helped to establish the then-newly launched Fox network. 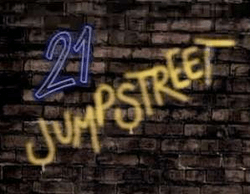 21 Jump Street was the first hit series for the Fox network. In August 1987, 21 Jump Street became the first Fox series to win its timeslot against a Big three network series. In the United Kingdom, it was shown on the similarly nascent, and interrelated, Sky One, which had yet to reach a sizeable audience. Season 4 was the last season to air on the Fox network. In commentary on the Season 5 DVD set, Peter DeLuise said that Fox had decided to cancel the show after Season 4 because the ratings had fallen below a set limit. Following this season Johnny Depp and Dustin Nguyen left the show. The departure of their characters was never explained in the narrative of the TV series, but in the movie it is explained that Hanson was transferred to the DEA and was later joined by Officer Penhall. The Booker spin-off crossover episode, "Wheels and Deals Part One", is included with 21 Jump Street's syndication package, and is also included on the fourth season DVD set. Officer Dean Garrett (David Barry Gray) makes his first appearance in "Everyday is Christmas". As it became harder for the original cast members to plausibly pass as high school students, his character and Officer Kati Rocky (Alexandra Powers) were intended to be "youthful" replacements, so the show could maintain its original premise of younger looking cops posing as high school students. Anchor Bay Entertainment released all five seasons of 21 Jump Street on DVD in Region 1 between 2004 and 2006. The releases contain extensive music substitutions and inaccurate cover art (for example, Richard Grieco appears on the cover of the season 4 set, despite appearing in only two episodes that season, while Johnny Depp appears on the season 5 cover, despite having left the series after the previous season). As of 2010, these releases have been discontinued and are now out of print. On October 14, 2009, it was announced that Mill Creek Entertainment had acquired the rights to several Stephen J. Cannell series, including 21 Jump Street, and subsequently re-released the first four seasons. In addition, Mill Creek also released 21 Jump Street - The Complete Series, an 18-disc collection featuring all 103 episodes of the series on DVD on July 27, 2010. In Region 2, Anchor Bay Entertainment has released all 5 seasons on DVD in the UK. They also released a complete series set on March 5, 2012. In Region 4, Madman Entertainment has released all five seasons on DVD in Australia. They also released a complete series collection on May 1, 2013. On March 16, 2012, a feature film sequel to the television series from Sony Pictures was released starring Jonah Hill and Channing Tatum (who are also executive producers) and directed by Phil Lord and Chris Miller with the screenplay written by Michael Bacall from a story by both Hill and Bacall. Johnny Depp, Peter DeLuise, and Holly Robinson briefly reprise their roles as Tom Hanson, Doug Penhall, and Judy Hoffs, respectively. The film proved to be a critically hailed box office success. Described in concept by Hill as an "R-rated, insane, Bad Boys-meets-John Hughes-type movie," the film departs from the dramatic style of the series and instead features a comedic tone. The film and series are also set in the same continuity. A sequel titled 22 Jump Street was released in 2014. ↑ Rosenberg, Howard (11 April 1987). "Weekend Tv : 'Jump Street' Bows On Fox Network". Los Angeles Times. Retrieved 30 March 2011. ↑ Mansour, David (2005). From Abba to Zoom: A Pop Culture Encyclopedia of the Late 20th Century. Kansas City, MO: Andrews McMeel Publishing. p. 501. ISBN 0-7407-5118-2. OCLC 57316726. 1 2 Blitz, Michael; Krasniewicz, Louise (2008). Johnny Depp: A Biography. Westport, Conn.: Greenwood Press. p. 28. ISBN 0-313-34300-4. OCLC 166290770. Retrieved 30 March 2011. ↑ Horowitz, Josh (14 May 2008). "Jonah Hill To Adapt '21 Jump Street' For The Big Screen: Report". mtv.com. Retrieved 2009-02-25. ↑ Hilmes, Michele (2010). Only Connect: A Cultural History of Broadcasting in the United States (3 ed.). Cengage Learning. p. 348. ISBN 0-495-57051-6. ↑ Lapin, Claudia (October 1988). "The Message of 21 Jump Street". Orange Coast Magazine. Emmis Communications. 41 (41): 192. ISSN 0279-0483. ↑ Mansour, David (2005). From Abba to Zoom: A Pop Culture Encyclopedia of the Late 20th Century. Andrews McMeel Publishing. p. 507. ISBN 0-740-75118-2. ↑ "Cannell and Mill Creek Ink New Distribution Deal" (Press release). TVShowsOnDVD.com. 14 October 2009. Retrieved 30 March 2011. ↑ Lambert, David (21 May 2010). "21 Jump Street - Mill Creek to Roll Out 'Season 3' and 'The Complete Series' on DVD". TVShowsOnDVD.com. Retrieved 30 March 2011. ↑ "21 Jump Street - Seasons 1-5". Amazon.co.uk. Retrieved 2014-08-24. ↑ "21 Jump Street: The Complete Series Collection". Ezydvd.com.au. 2013-04-22. Retrieved 2014-08-24. ↑ Coll, Kevin (28 May 2009). "Jonah Hill Talks 21 Jump Street Remake Movie". Fused Film.